Why Buy an Electric Bike from Empowering E-Bikes? Battery range is highly variable depending on factors such as how many hills. The realistic range of the Empowering E-Bikes system is up to 60 miles; range may be reduced to around 30 miles if riding a heavily laden bike up a continuous series of steep hills. Note that many manufacturers grossly overstate the likely range; if comparing alternative systems, then, except and in so far as they have a battery capacity greater than 17 Amp hours, any higher claimed ranges are almost certainly just more optimistic in their assumptions of energy use. The battery is a key component of any electric bike system. Consistent with most high quality electric bike systems, standard Empowering E-Bikes battery packs are constructed from rechargeable 18650 lithium (Li) ion cells. These are cylindrical cells with a metal case, providing greater protection than the older, flat plastic wrapped (lithium polymer) format that used to be common. Each cell is ~ 18 mm diameter and 65mm high; slightly larger than a standrad AA cell. The individual cells have a nominal voltage (when about half charged) of 3.6 volts. For an Empowering E-Bike battery pack (again consistent with most 250W electric bike systems) 10 are connected in series, giving an overall voltage of 10 x 3.6 = 36V. A number of these 10 cell units are connected in parallel according to requirements, with more parallel units giving a higher battery capacity (i.e. energy content). A 36V battery will have a voltage of 42V when fully charged, and not less than 30V when fully discharged. Measuring the battery voltage is therefore the best way to be sure how 'full' a battery is. Although there will be slight differences between cell types, most batteries as they discharge will drop rapidly to below approximately 40V, then steadily down to approximately 33V, before the voltage drops rapidly (battery is empty). The specific 36 Volt batteries offered by Empowering E-Bikes as part of the conversion service have been selected based on the following criteria. The batteries are designed to mount onto the bike frame, locking in place with a key mechanism, but easy to remove for storage or charging. Typically the battery would be mounted within the frame triangle, to keep the weight low down and centred. If however there is insufficient space to do this then a rack mounted solution would be offered. Multiple batteries can be provided as part of a package to create a true long distance vehicle; the second (or third!) 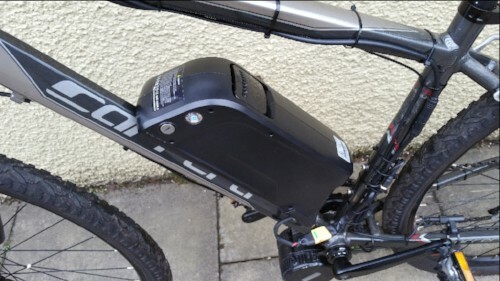 battery would be carried in a pannier and simply mounted when the first one ran out (both the battery and the BBS01 controller sense the battery voltage; when it drops below a certain level one or the other will cut it out, and the bike motor simply switches off). It is also easy to carry the battery charger to increase range by for example recharging over lunch. Based on Li manganese ("IMR") or Li nickel and mixed nickel / manganese / cobalt ("INR", "NCR") chemistries. Manufacturers have individual and proprietary compositions for their batteries, however these two 'families' of chemistry are the types generally used for power tools, and are more capable of putting the out the high currents needed to run electric bikes. The first reason for this is to avoid over-heating; the cells used generate less heat and are less prone to overheating than the types of cells used in, for example, mobile phones. The second (related) reason is that battery pack needs to be powerful enough to support the high level of current required. This should not be an issue with high quality electric bike batteries. However, all batteries will have show a performance dip when putting out high current continuously; this is seen as a voltage drop while the battery is putting out current, the higher the current the greater the drop. The drop is reversible when the battery stops putting out current. One key question regarding electric bikes is what is the range. Unfortunately, it is hard to give a simple answer to this (in the same way as 'what is the range of a car?') as it depends on several factors as follows. Firstly, the total amount of electrical current that can be taken from the battery, which is the current times the time the current flows for, expressed in Amp hours (Ah). This is easy to confuse: amps is the electrical current flowing at any one time; amp hours is the total amount of current taken. By analogy to water flowing from a tap, amps would be the rate of water flowing from the tap; amp hours used would be the volume of water in the bath. Going back to the E-Bike: the Empowering E-Bike motor controller will allow a maximum current of 15 Amps at any one time; the battery has a capacity of 17 Amp hours. Running the motor continuously at top capacity, the battery would therefore last for 17 Amp hours divided by 15 amps = 1.13 hours, or 68 minutes. (This is as an example: in reality this would not be necessary or good for the motor or battery, and in practice the battery would be discharged at variable rates over a much longer time period). Secondly, the energy content, in Watt Hours (Wh). This is the Amp hour content multiplied by the voltage (36V). The 17 Amp hour Empowering E-bikes battery therefore contains 17 x 36 = 612 Wh when fully charged. (For comparison, 1000 Wh = 1 kilowatt hour = 1 domestic electricity unit). Regardless of manufacturer claims (which can be, and unfortunately often are, grossly overstated), the likely range from a battery will be in proportion to the number of Watt hours the battery contains. The number of Watt hours is analogous to the size of the fuel tank on a vehicle. If comparing batteries from different suppliers therefore, always ensure that you compare the actual capacity of the batteries, whether in amp hours or Watt hours. Typical 36V electric bike batteries will have capacity from 10 to 15 Ah (360 to 540 Wh). Secondly, the actual range will also depend on how the bike is ridden, and therefore how much energy is being taken from the battery for each mile covered (analogous to the variation in miles per gallon for cars). More energy will be used, and so the range reduced, by the following factors. Hills. Very hilly terrain is the main factor in reducing effective range. Headwinds. As with hills, riding an electric bike into strong headwinds which would make it hard work to pedal can be extremely satisfying, but again reduces effective range. Heavy bike / rider / load. Electric bikes allow for the possibility of carrying serious loads, but more weight uses more energy. Extra weight makes some difference on the flat, but will have a significant extra impact on range when combined with hills. Motor running below its optimum rpm. As well as limiting motor performance and generating excess heat, running the motor below its optimum rpm will take a disproportionate amount of energy from the battery when running inefficiently and so limit range. This is less of a problem with an Empowering E-Bikes mid drive that can operate through a low bike gear on hills, but if the hill is still too steep and the bike stalls then it may be best to push, maybe using the motor to propel the bike without the rider. Temperature. Lithium batteries have optimum performance at around 20°C; at temperatures approaching or below 0°C a significant loss of performance can be noticed. In winter therefore it is best to store the battery in a warm location prior to use. Style of riding. Riding aggressively will clearly tend to use more energy. From personal experience, 'practical' use (where one is more likely to keep up higher speeds to get to a destination faster) are likely to lead to lower range than 'recreational' use, although the two clearly overlap in practice. Other factors, for example riding through snow or loose sand can drastically reduce range. Moderate speed, generally using the pedal assist for moderate motor assist with use of throttle for hill climbing as required: 10 Watt hours used per mile for a range of (600/10 = ) 60 miles. Large number of hills, heavily loaded bike, extended use of throttle for full power to keep up high speeds - 20 watt hours used per mile for a range of (600/20 = ) 30 miles.